A world of thanks to our Mitzvah Day Participants, Project Leaders, Volunteers, Donors, and Lay leadership team Lloyd Comstock, Doug Fein, Martin Feinstein and our amazing staff liaison Juliet Jensen. Made 48 signs for CROP Walk Durham - Join Team Judea on April 7 to raise funds to end hunger in Durham and around the world. Contact Chip Carnathan for details on how to participate! Wrote 75 letters to elected leaders in support of refugees, people seeking asylum and for an end to ICE raids in our state; and 65 cards of solidarity and hope to immigrants being held at Stewart Detention Center in Lumpkin, GA. Created 110 beautiful bookmarks for kids who receive books from Book Harvest. Cooked casseroles and donated the full dinner for up to 200 people at Urban Ministries (something we do EVERY MONTH with two other Jewish congregations in Durham). Prepared lunches for 300 homeless and food insecure people, distributed on Monday via Urban Ministries. Donated and packaged 225 pounds of cat and dog food for the pets of Durham Meals on Wheels clients. Donated over 100 pairs of prescription eye glasses to the Lions Club. Cared for our sanctuary, cleaning and checking prayer books that need repair. Join us for our annual Mitzvah Day from 9:00 am to 12 pm on Sunday, February 24. We will begin with a convocation in the sanctuary at 9:30 am, then disperse to sites at JRC to begin our project work at 10 am. A variety of projects means that there will be a fun and meaningful activity for all ages and abilities. Projects include preparing meals for Urban Ministries of Durham, making cards for Passover, creating signs for the annual CROP Walk Against Hunger, advocating for justice and kindness for refugees, and donating blood to the Red Cross, and more! 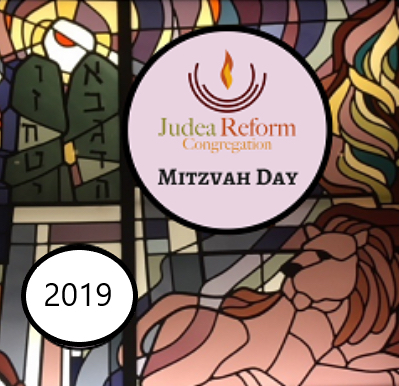 Mitzvah Day is a wonderful opportunity to engage and work together in helpful and meaningful projects of direct action, and advocacy to better our community, by doing mitzvot for our neighbors and non-profit community partners. All are welcome - whether you are a member of Judea Reform or not! Please also consider registering for a 15-minute slot to donate blood. * The American Red Cross Bloodmobile will be on site from 10:00 am - 2:30 pm and is in urgent need of blood donations! Sign up at www.redcrossblood.org and enter keyword Judea. Donate much-needed Mitzvah Day supplies, whether for your project or another, and drop off in advance at Judea Reform. Click HERE for the supply list and to sign up to donate. Religious School will be in session on Mitzvah Day. Students will be participating with their classrooms/ teachers in a pre-assigned project; parents of Religious School parents can register for any project of their own choosing. Welcome the Stranger. Many of our relatives were lost because no one spoke up for them in the 1940s and before. We'll write cards to our elected officials in the new congress to advocate for humane, just and welcoming policies for refugees, asylum seekers and immigrants. We'll share an update and provide guidance on specific messages. We will also write cards and messages of support to detainees - many from NC - who are imprisoned at Stewart Detention Center in Lumpkin, GA.
Join us as we make fabric bookmarks that Book Harvest will give to kids who receive books from them. We will have blank bookmarks made from fabric that you decorate with fun accent fabrics that are permanently fused together, and then you add pretty yarn tassels. The bloodmobile will be on-site at Judea Reform from 10:00 am to 2:30 pm. Sign up for a 15-minute time slot to donate blood at this link: www.redcrossblood.org and enter keyword Judea. Quick & easy to do even if you're signed up for another project! Appropriate for: must be at least 16 years old, weigh at least 110 lbs. Join us in crafting Passover greeting cards that Judea Reform will send to our older congregants. Participants will decorate cards, write their own messages, and prepare the cards for mailing. Appropriate for: Adults and mature children with an accompanying adult. Participants will be standing, working with food (hot and cold ingredients) and need to be able to follow directions. Join us preparing for our annual participation in the CROP walk which happens on April 7th. Judea Reform volunteers to provide posters intended to teach walkers and others about hunger in Durham, the US and the rest of the world. These posters are placed along the Durham CROP Hunger Walk route where upwards of 2000 people view them during the CROP Hunger Walk. Your participation in the project involves the design and preparation of posters. Join us as we make sandwiches & package other lunch items for people experiencing homelessness who receive services from Urban Ministries in Durham. Please also sign up to contribute supplies at this link. Join us in providing a meal for the pets of home-bound Durham people who receive a Meals on Wheels dinner. Meals on Wheels Durham is also seeking volunteers to assist with the growing need in Durham, stop by their table at Mitzvah Day to chat with Executive Director, Gale Adland. and inspect prayer books for have markings that should not be there, or have inserts that should be removed. Pre-register via http://vhub.at/interfaithnc to join us on an Orange Habitat Build. We will be working outdoors. Bring a hammer and gloves, closed-toed shoes, and dress appropriately for the weather. We will be working 8:15-Noon in Hillsborough. Sign up ASAP as slots are filling fast on this interfaith build. Please bring eyeglasses that you no longer use and drop them in the box in the Judea Reform Lobby. They will donated to Lions Club of Durham who collect eyewear to distribute to needy recipients free of charge. Prescription glasses, sunglasses, goggles, and other visual aids that are suitable for immediate use after cleaning are accepted. Want to volunteer, participate or have questions? please email socialaction@judeareform.org.